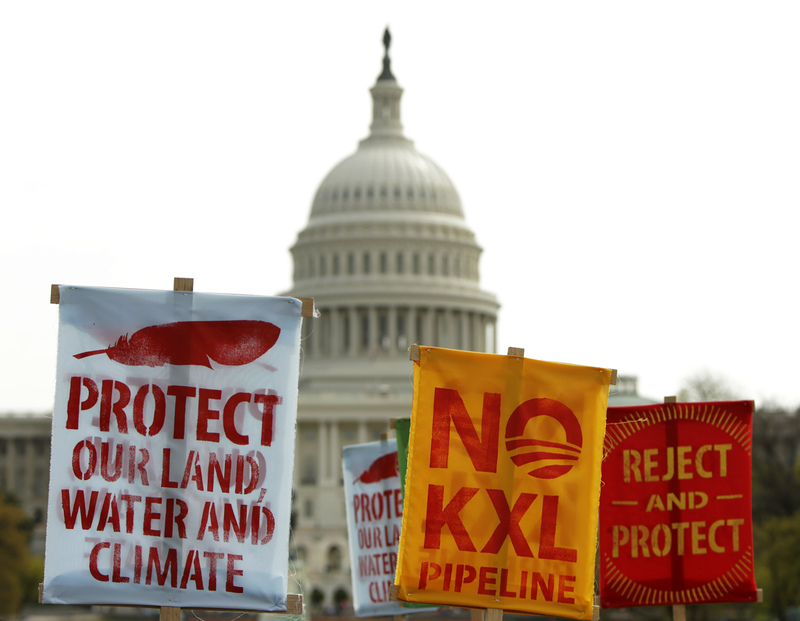 The U.S. government’s continued deferral on the Keystone pipeline decision is a case in point. One year’s economic benefit from the project may be $1.8 bln; if the answer is no, the energy system can be optimized another way. Win or lose, regulators need to make up their minds. Members of the Cowboys and Indian Alliance, a group of ranchers, farmers and indigenous leaders, lift their signs in protest against the Keystone XL pipeline in front of the U.S. Capitol in Washington April 22, 2014. The U.S. State Department announced on April 17 that it would no longer deliver a decision on the Keystone XL pipeline expansion in May, but would await the decision of a Nebraska court on the matter. The Keystone XL pipeline expansion will run from Hardisty, Alberta to Steele City, Nebraska and together with the Keystone Third Phase domestic pipeline would have the initial capacity to deliver 700,000 barrels per day of Western Canadian Select crude oil from Alberta and the Bakken oil shale formation in North Dakota to Cushing, Oklahoma, Nederland, Texas and Moore Junction, Texas. Its sponsor TransCanada has dedicated one quarter of Keystone XL’s capacity to Bakken oil. The most recent estimated project cost of Keystone XL is $7 billion. This item has been corrected to read 700,000 not 70,000 in the third paragraph.